"Working Man" heard in "Goon"
Rush's "Working Man" is heard in the new movie Goon starring Seann William Scott which was just released in Canada this past Friday, February 24th. The film will have a limited run in the US starting March 30th; for more details visit imdb.com. - Thanks to Paul Dryer for the headsup! "2112" Featured on BBC 2's "Sound of the 70s"
2112 was the featured album on BBC Radio 2’s "Sound of the 70s Show" with Johnnie Walker today, February 26th. This is a national radio station and the program was broadcast during prime-time. Check out the BBC iplayer in the next few days to hear it online. While not a particularly informative show from a Rush point of view, simply being played on the UKs most popular radio station is a pretty big deal! - Thanks to David Cooke for the headsup! 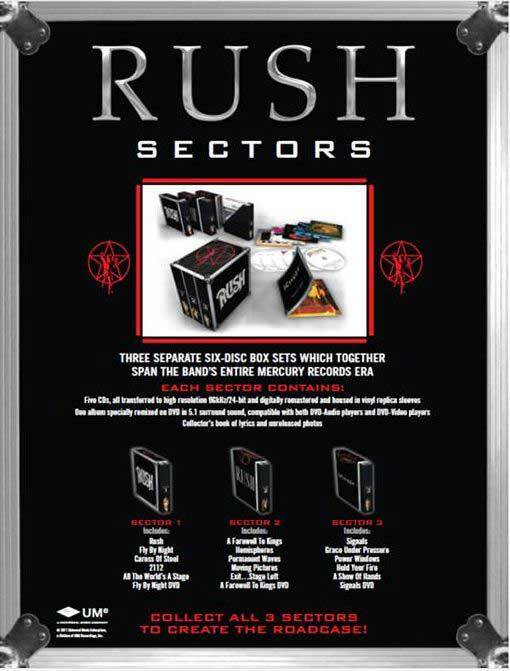 Masterdisk Chief Engineer Andy VanDette, who recently remastered Rush's Mercury catalogue for the Sectors boxed sets, spoke to Arstechnica.com about the creation of compressed versions of each song specifically for the iTunes Store. "VanDette explained how mastering varies depending on the age of the original recordings as well as the final output format. Many master recordings for Rush albums are from vinyl's heyday, he said. 'Back then we would try and hide as much top end as possible, knowing that the end users' styli would be crap. Most listeners today swear they love the bottom end on vinyl, but I remember in the heyday of vinyl, it was all about top end. If we could only have a clear top end without all those pops and clicks' we thought,' he said, noting the tendency of low-end record players to introduce unwanted noise. 'Back then, bottom was the enemy. It made the grooves [in the vinyl] too wide, and forced us to turn down the overall level of the disc.'" "The constraints of vinyl aren't a concern when mastering for a CD, so it's possible to boost overall levels as well as low frequencies without ruining the rest of the mix. 'While remastering the classic Rush albums, I added as much LF as I could, always aware not to cloud the classic 'ping' on Neil's snare, muddle Geddy's voice, or bury Alex's guitar,' he said. 'These are some finely balanced mixes, even 35 years later,' VanDette said. 'I wanted to make sure the listener still heard the classic album come through, without it being too loud, boomy, or modern sounding. Mastering for iTunes was a different challenge. You can't get around it-when you throw away 80 percent of the data, the sound changes. It was my quest to make the AAC files sound as close to the CD as possible; I did not want them to be any more loud, hyped, or boomy sounding than the CD.'" "Because iTunes tracks are typically played back on decidedly average earbuds or computer speakers, there is a tendency for some producers to boost bass frequencies to make up for the tinny sound. However, VanDette said, doing so is not really the answer. For one thing, there's no guarantee that playback will always happen on sub-par equipment...Creating iTunes-specific masters for Rush's albums required a more nuanced approach than just boosting the bass. 'The delicate mix balances of a Rush album dictated that I could only 'nudge' the bottom, not really boost it. 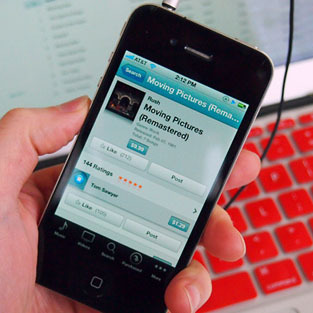 For iTunes mastering I focused on making up for the losses created by the iTunes AAC algorithm. Generally, I heard changes in level, bottom, top, punch, and imaging.' But not every album, or even every song, could be treated the same way. 'On a live album I found the center image was lower, making Geddy's vocal too low in the mix,' VanDette said. 'It was rare to be able to use one static setting for an entire album.'" For the full article visit arstechnica.com. - Thanks to Ed at RushIsABand for the headsup! 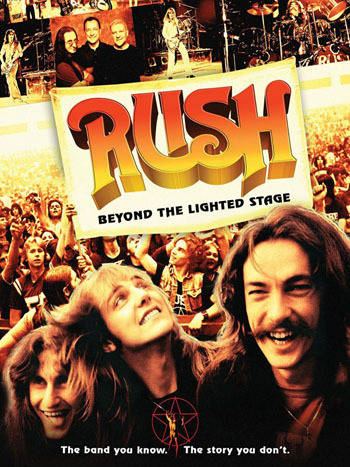 The Israel premiere of Rush: Beyond the Lighted Stage will take place on Sunday at the Tel Aviv Cinematheque at 10 p.m. The debut will be followed by midnight screenings on March 2, 9, 23 and 30. "...it’s only fitting that it’s a fan of the Canadian progressive rock heroes who’s bringing the film Rush: Beyond the Lighted Stage to Israel. 'I first started listening to Rush when I was in Israel on a Youth Aliya program in 1981,' says New York native Alex Gutman, who immigrated to Tel Aviv in 2009...Ever since he arrived in Israel, where he works as a 'technology evangelist' by day, Gutman has been in touch with promoters and with Rush’s management about bringing the band here to perform. But when he heard about the film, he decided to begin with a more modest venture and get the buzz going about the band." For more info visit jpost.com. 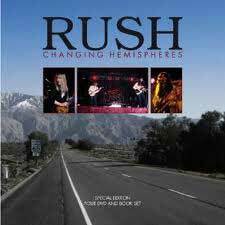 Last November 22nd, a new documentary was released from the UK titled "Changing Hemispheres" which you can order here. The package includes four all region DVDs, a 116 page book with "masterful and comprehensive text packed with great photographs of the band" as well as "audio interviews with the band members compared and contrasted with the views of a leading team of music journalists, insiders and musicologists." John with Cygnux-X1.net was taken the time to transcribe the 166 page book for your reading pleasure, which you can read here. - Thanks John for the headsup! 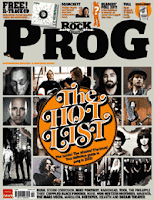 The new issue of Classic Rock Presents Prog has hit the newsstands, and includes a brief interview with Geddy Lee. The article confirms that Clockwork Angels will be released in May, and Geddy talks about excitement over the band's switch to the Roadrunner label, after having a poor experience with Atlantic. "There was something about the people at Roadrunner, they were so into rock, into what we're all about as opposed to some of the Atlantic guys...we were very unhappy with the way we were treated at Atlantic UK, I don't think they really got us, so it was good to go somewhere that did." "The last tour was so great...I can't wait to experience that again. People seem ta little less afraid to show that they're Rush fans. I think we all enjoyed it, I don't think I've ever seen Neil enjoy a tour so much." - Thanks Tony for the headsup! Moog.com has posted a three part video interview on their site where Geddy Lee discusses the Moog Taurus Pedals. "Moog visited Geddy Lee in his Toronto studio to get his take on the Taurus pedals, old and new. This is the first of a 3-part series relaying touching stories and musical innovations from the start of Rush's reigning fame to now. In this installment, Geddy talks about his first introduction to the Taurus sound and what he would like to see next from Moog...Minitaur." - Moog.com, January 5th, 2012 Thanks to Jim Pomeranz for the headsup! The small device near Geddy is the new Taurus Minitaur, which Moog announced at NAMM 2012. Joe Bergamini, senior drum editor with Hudson Music and co-producer of Neil Peart's Taking Center Stage DVD, who appeared with him in it as interviewer, is also a talented drummer for the instrumental progressive rock band 4front. Both Bergamini and 4front's guitarist/keyboardist Zak Rizvi were with the popular New York based rush tribute band "Power Windows" for 11 years. Their new album, "Malice in Wonderland", is now available; checkout a preview track "Big Scary Monster" now. The album includes the song "Many Places in a Rush", a tribute to Rush, and features album art designed by Rush's long time art designer Hugh Syme. 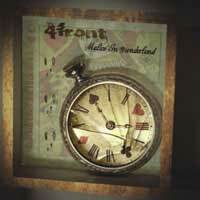 "4Front is an instrumental progressive rock band that combines the classic sound of prog with many other stylistic elements to create cinematic soundscapes that will capture your imagination. Combining top-notch playing, intricate arrangements, odd time signatures, and symphonic themes, 4Front prides themselves on being accessible to the regular rock listener via a strong focus on songwriting, not just technical playing. Fans of Rush, Dream Theater, Kansas, Symphony X, The Dixie Dregs, and Genesis will feel like they have known this band forever. But 4Front’s pallette of influences is much deeper, ranging from Billy Joel and Joe Jackson to film composers like John Williams and Randy Newman." For more info visit www.joebergamini.com/ or www.facebook.com/4frontband. The March issue of the UK's Decanter magazine includes a short interview with Geddy Lee in the "My Passion For Wine" column. Geddy talks about how he first became a collector and what his current preferences are. Below is a brief excerpt; thanks to Douglas Wilson for the headsup! "I was introduced to fine wine while touring in the late 1970s. Alex Lifeson (Rush's lead guitarist) had a big interest in wine so promoters would sometimes give us wine as gifts...Alex and I always reward ourselves after a show with a good bottle of wine. It's a kind of hobby of mine to find a good bottle in whatever city we're touring in and surprise Alex with that." "Replacement 'Fly By Night' CDs and 'A Farewell To Kings' DVDs are now available. Rush.com has added two interviews featuring Mercury-era interviews with Geddy, Alex & Neil, compiled from the archives of InTheStudio.net in celebration of the Sectors Box set release. Multiple wallpaper images from the boxed set booklets have been added to the Desktop Wallpaper page. - Thanks to John @ Cygnus-X1.net for the raw images! Universal Music has confirmed all 15 albums were remastered in 96/24 then downconverted for CD in 44.1/16; only the DVD has the full 96/24 lossless audio. However, all 15 albums are going to be available as full 96/24 downloads at HDTracks.com for about $18 each. Rush Featured On "Metal Evolution"
UPDATE: Click here to view the full episode of the Progressive Metal episode of "Metal Evolution" which heavily features Rush! "Progressive metal" is featured on the final episode of Sam Dunn and Scot McFadyen's Metal Evolution which premiered in the US on February 4th on VH1 Classic. The episode aired the previous Friday, January 20th, MuchMoreMusic in Canada. Sam Dunn had already stated that Rush will be heavily featured, and in fact all three members of Rush as well as early producer Terry Brown are interviewed. Other progressive metal bands interviewed include Dream Theater, Queensryche, Yes and King Crimson to name a few. Click here for more information. - Thanks to Mike Salvini for the headsup! Today was Rush Day, February 1st, 2012 (2.1.12), a once in a lifetime occurrence as it will not happen again for another 100 years. It was a popular day around the net, including various news stories from multiple sources, and culminated in the 2112 listening party hosed by RushCon and Rush Radio at tinychat.com/rushcon. 2.1.12 was also the day of the first known performance of a Rush song on American Idol. Coincidence? The song was of course "Tom Sawyer", sung by David Weed of Mountain Home, Idaho. Unfortunately, David did not make it through to Hollywood, but it was satisfying to hear Randy Jackson say that the singer doesn't sound like Geddy, because Geddy "sounds really good".